Of the 10 days jam-packed with music and incredible performances, Paste Magazine will be hosting the showcases that take place March 16 & 17. Check out Paste’s official lineup for these two days after the jump. 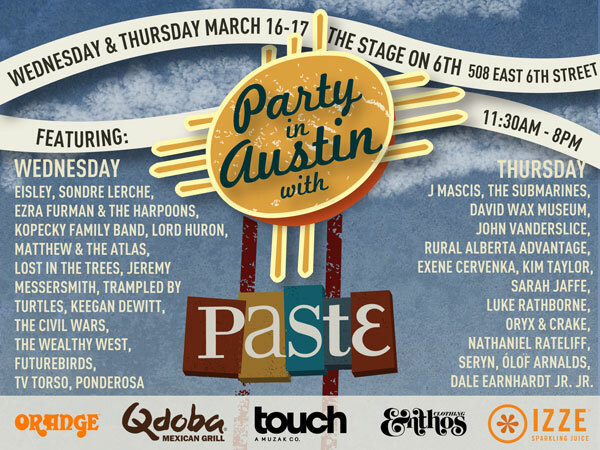 The 2011 Paste Party In Austin will take place at The Stage On Sixth (507 East 6th Street). Doors will open at 11:30 am with performances from 12 to 8. Courtesy of Qdoba, free burritos and nachos will be provided until supplies last. The parties are free and open to the public and SXSW badgeholders, age 21+.